The Vegetarian Athlete. Is There Such A Thing? A vegetarian diet for endurance athletes is really not all that different from a normal and healthy diet, minus the meat of course. If you’re already eating lots of nutritious, whole foods as it is, there really aren’t all that many adjustments you need to make to go vegetarian. You can take it as far as you want, and some vegetarian and vegan athletes tend toward raw and gluten-free diets, citing even greater energy gains. There are different degrees of health in even vegetarian diets. 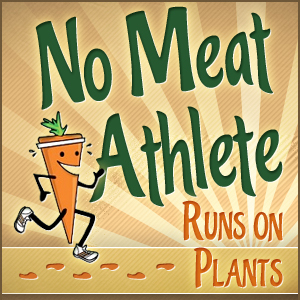 http://www.nomeatathlete.com/ is a great vegetarian and vegan athlete resource! There are some fantastic books out there that promote what I consider to be an “ideal” diet, from the standpoint of athletic performance. Vegan, high-raw, alkaline eating is great but, it’s tough. Lots of strange ingredients, low-temperature cooking, and very little starchy goodness for the pasta lovers among us, are included. For meat-eaters looking to make a change, the gap between this type of diet and their current one is huge. I’d like to offer an alternative, a diet that is vegetarian, that’s substantial enough to support endurance training, and that’s delicious and accessible to new vegetarians. I’ll be the first to admit you can do better nutritionally, but I believe that it’s more important to have a diet you’ll stick to first. Once you’re used to eating vegetarian or vegan, that’s when it’s time to consider taking it to the next level. 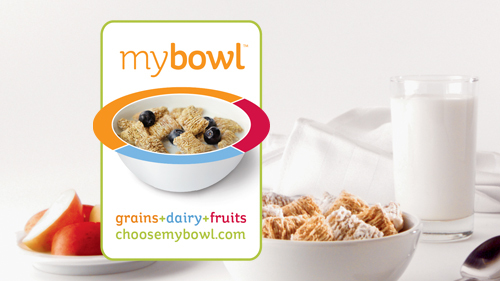 Protein is in all types of different foods besides meat, but generally in lower quantities. It takes some effort to make sure you get some protein in every meal, but it’s not that hard. While it is possible to eat a high-protein vegetarian diet, if your goal is to get the amount of protein recommended by many traditional diets for athletes, you’ll have a tough time doing it. Having heard that many endurance athletes thrive on diets with lower amounts of protein, than is traditionally recommended, many people take a chance on it, and have never felt better in their lives. If your vegetarian diet is pizza and potato chips, then you won’t get enough protein. But if you eat a wide variety of foods and make smart choices to include some protein at every meal and ensure that you’re getting a balanced amino acid profile, chances are you’ll feel better than ever. This list represents some common foods that will help you meet the needs of the vegetarian diet for endurance athletes. Certainly there are many more foods one could include; the idea here is to list those that can be found in common grocery stores and whose tastes aren’t too foreign. The key here is to have an open mind to new foods. 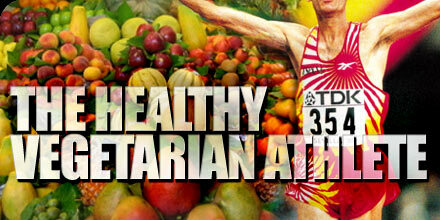 Who knew that an athlete could be healthy vegetarian too! If you aim to hit these numbers with a vegetarian diet, you should do well. And you’ll find that it’s not all that hard to do. About as much as it takes to feel comfortably full, but not stuffed. As endurance athletes, we have the luxury of eating more calories than more sedentary people. We need more calories, in fact. If your goal is weight loss, or if you train more or less than most people so, your needs will be different than most. Depending on your workout regimen, figure out what size meals work for you. 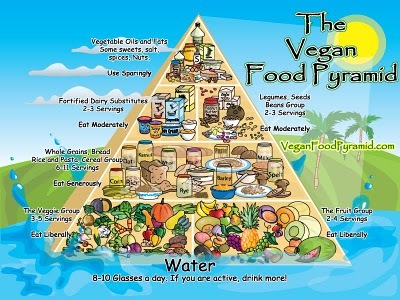 The Vegan Food Guide pyramid. Most vegetarian/vegan athletes will have higher energy needs compared to this. But, this shows the foundation for the lifestyle. How you eat before, during, and after your workouts is especially important on any diet. Guidelines and recipes for unprocessed, vegetarians’ workout foods especially come in handy at this point. No more than 25% of your post-workout snack should come from protein, make sure you avoid too much fiber and high-fat foods as well. So there you have it: A practical vegetarian diet for endurance athletes. Not that much to it, is there? I began the lesson as I did last week, by introducing myself, Rileigh Johnson and Leah Gecheo to the students. A lot of the students remembered us from last week so, they were excited to see us again. Some of the students were also excited that Rileigh and I remembered them as well. I told the class that we were going to continue our talk about Asia. This week our Asian focus was on India. On each table where the children were sitting, was a blank map of Asia and each student had a blank coloring page of a peacock. 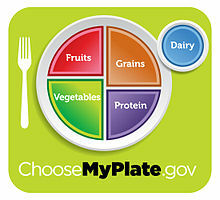 As a class, we went over the difference between India’s food guide pyramid and our MyPlate. We went over types of foods and spices like curry. We asked the children if any of them tried mangoes before. We talked about how mangoes grow in India and how Indians use mangoes in many of their common dishes. Children raised their hands to share stories about when and what they tried that had mangoes in them. A common answer I noticed was McDonald’s smoothies with mango and pineapple. 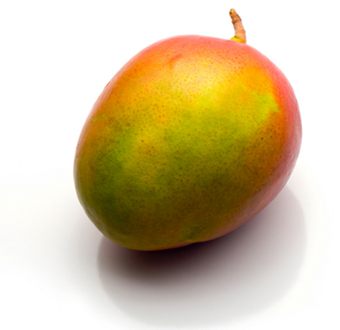 The children said they never actually saw a mango so, we passed one around for them to have a sensory evaluation of the fruit we were discussing. We talked about the importance of vitamins like vitamin A, C, and D. We asked them to name some examples of the different vitamins in mangoes and what these vitamins do to help your body. The children knew more about vitamin D than any other vitamin we talked about. They remembered some things about vitamin A because we briefly talk about that last week. We initially planned on having the students make origami and color peacocks, India’s national bird. But, experienced that the origami was too difficult for the first group of students so, we just had the second and third groups color the peacocks. They then turned these peacocks into crowns and most of the students left the class wearing them as “Indian Princesses” and “Indian Kings”. Our snack this week was mango lassi. The children were excited to try the mango smoothie but, a lot of the children weren’t huge fans of the mango desert. The smoothie consisted of mangoes, honey, vanilla yogurt, and 1% milk. The main complaint we heard is that the children didn’t like the honey. They liked the mango when we gave out sample slices of it though. Overall, I think it was a success except for the snack idea. I think next I would do this lesson, I would choose a different snack idea that included mangoes.